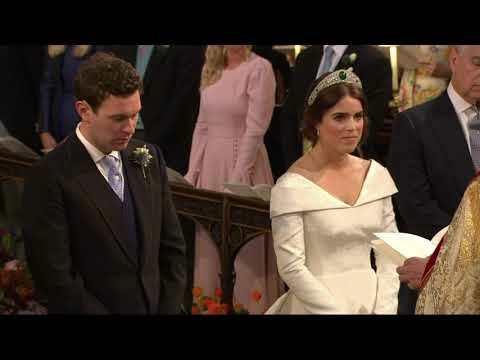 WINDSOR, England (AP) — Britain’s Princess Eugenie married tequila brand ambassador Jack Brooksbank in a star-studded royal wedding Friday at St. George’s Chapel on the grounds of Windsor Castle. The 28-year-old bride, the queen’s granddaughter, is ninth in line to the British throne. She wore a long-sleeved gown with a fitted top, a peplum and a long train by British-based designers Peter Pilotto and Christopher De Vos and a diamond-and-emerald tiara loaned to her by the queen. The 92-year-old queen and her husband, Prince Philip, attended the wedding, along with other senior royals, including Prince Charles; Prince William and his wife Kate, the duchess of Cambridge; and Prince Harry with Meghan, the duchess of Sussex. There had been doubts about whether the 97-year-old Philip would be well enough to attend, but he seemed to be in good form during a rare public appearance. Prince Charles’ wife, Camilla, missed the wedding because of other commitments. Eugenie’s sister, Princess Beatrice, served as maid of honor — she read a selection from F. Scott Fitzgerald’s “The Great Gatsby” during the service. They are the daughters of Prince Andrew and Sarah Ferguson, who are divorced but enjoy an amicable relationship. The A-list guests included Hollywood stars Demi Moore and Liv Tyler, fashion luminaries Kate Moss, Cara Delevingne and Naomi Campbell and pop singer Robbie Williams, whose daughter was a bridesmaid. Eugenie’s dress was cut in a deep V in the front and the back, a feature requested by the bride that revealed a vertical scar from her surgery at age 12 to correct scoliosis. She has said previously it’s important for people to show their scars. Kate, the Duchess of Cambridge, wore a fuchsia dress by Alexander McQueen and a hat by Philip Treacy — Britain’s premier milliner. Meghan, the Duchess of Sussex, wore a navy dress and coat by Givenchy. There were occasional blue skies on a generally cloudy, gusty day as the royal standard flew atop the Windsor Castle complex, indicating the queen was in residence. The strong winds forced many women to hold on to their elaborate hats as they approached the chapel. Eugenie works at a contemporary art gallery. The couple, who had dated for seven years, got engaged in January when Brooksbank, 32, proposed during a trip to Nicaragua. They married in the same venue used in May by Harry and Meghan. William and Kate’s 5-year-old son, Prince George, served as a page boy, and their daughter, 3-year-old Princess Charlotte, was one of six bridesmaids. There was no sign of 5-month-old Prince Louis, William and Kate’s youngest child. The bride’s parents left the chapel together smiling as the newlyweds embarked on a horse-drawn carriage ride through parts of Windsor. The queen hosted a champagne luncheon for the guests just after the ceremony, with a second reception planned for the evening. The couple invited 1,200 members of the public to come onto the castle grounds for a closer glimpse of proceedings. There were also crowds of well-wishers on the streets outside the imposing castle, the site of Harry’s marriage to Meghan Markle in May.